We're up for the- County- cups! We don't normally write about County Cup competitions, but there are a few dates for your diary that we thought you might like to know about. A number of our sides have reached finals, and you might just want to go and watch them lift some silverware! We start in Norfolk, where on 30th April Dereham Town will take on Thetford Town in the County Cup Final. This match will be held at Carrow Road, home of Norwich City- and by the way, Thetford was the location for filming of one of Britain's favourite sitcoms, Dad's Army (not that that's at all relevant to football, but we thought you might like to know!). Kick off is at 7.30PM. The next one we're not sure about. On May 6th Marlow are meant to be taking on Reading FC in the Final of the Berks and Bucks Senior Cup. The reason we're not sure about is is that news is coming through that Marlow have been removed from the competition- subject to appeal- for playing an ineligible player. The club, given manager Mark Bartley's explanation of the decision on social media, are undoubtedly going to appeal, so we'll remain hopeful that they'll be able to take their places in the match and let you know nearer the time. 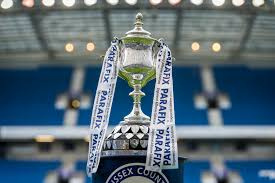 Next up, on Tuesday 7th May, two of our sides go head to head in the Sussex Senior Cup Final, to be held at Brighton & Hove Albion's magnificent Amex. Bognor Regis Town, who knocked out Brighton's Under 23 side this week, will face Burgess Hill Town. Kick off is at 7.45 PM. Also on May 7th, Meadowbank, home of Dorking Wanderers, will host the Surrey Senior Cup Final, and our very own Tooting & Mitcham United will take on one of our former clubs, Metropolitan Police. Kick off 7.45 PM. Another match scheduled for the 7th May will be held at Hanwell Town, where Uxbridge have reached the Final of the Middlesex Senior Charity Cup. They will be joined in that Final by another Bostik League side, and indeed another Bostik South Central side, as Ashford Town and Northwood contest the other Semi-Final. Uxbridge defeated Hampton & Richmond Borough on penalties to reach the Final. Finally, at Portman Road, home of Ipswich Town, our very own Felixstowe and Walton United will take on our former favourites Leiston in the Final of the Suffolk County Cup. That will take place on Wednesday 8th May.  It’s a crucial Bostik Weekend! Cray fight for the title, many clubs fight over playoff places, and many more fight to escape the drop. Where will you be watching? Here’s our preview.